Aeration width = 36" wide. Unit size = 47" wide. Handle does not fold down. Water containers give weight to the unit to press tine 3"-4" x 3/4" dia into the ground. 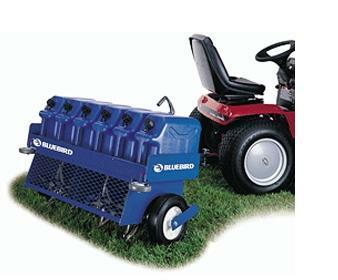 * Please call us for any questions on our aerator towable 36 inch rentals in Mount Pleasant MI, Alma MI, and Saginaw MI.